Through song, CCC endeavors to cultivate within our students the avenue to different cultures, different perspectives, and ultimately, a fluent passion for the world’s musical dialogue. We hope to provide, guide, and nurture the art of choral music as an empowering foundation from which students can launch their dreams. The Preparatory Program is an exceptional experience to enable all preschool-aged children (3-6 year olds) to reach their full potential in singing, ear-training, vocabulary and body movement skills. Classes are offered by three sessions in a year, 8 weeks per session. Learn more about Crystal School. Level I is for young beginners in 1st and 2nd grade with no or little previous musical experience. Curriculum includes beginning solfege / sight singing, singing in intervals, rhythm and reading techniques, and proper vowel placement. 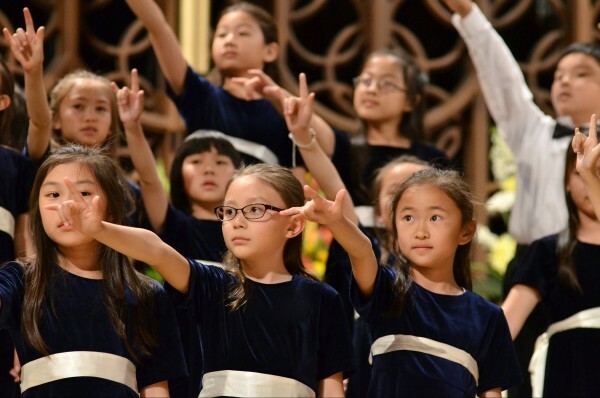 Level II choristers who are in 2nd and 3rd grade, are mostly advanced from level I and are ready for further development. Curriculum includes the next step in music literacy and voice development. Emphasis on posture, ear training, building harmony and further performance skills. Continues to master vocal and reading skills, focusing on skills needed for advanced chorus. Curriculum includes continuing to reinforce and teach theory and sight singing. Emphasis on more complex vocal technique, musicianship, and more development in 3 part harmony. Intermediate level is for 3rd grade to 5th grade. They have the chance to tour locally. The level IV is for choristers who are in 4th grade and above and have mastered the vocal skills and techniques of Preparatory, Primary and Intermediate as well as pass the internal audition. Challenging literature at a high level of proficiency is studied. A certain amount of maturity of voice is required. Curriculum includes advanced literature, 4 part harmony, and continuing to emphasize in vocal development. They have the chance to tour locally and nationally. A performance-oriented group of about 300 students consisting of four divisions: Concert Choir, Youth Choir, Young Men, and Young Women. Students must be at least in 6th grade and possess music literacy. In addition to concert tours within the United States and abroad, there is mandatory attendance at an annual Music Camp every August.